Mouse anti Dog C-reactive protein, clone cCRP1 recognizes canine C-reactive protein (CRP), a calcium-binding acute phase reactant belonging to the pentraxin family which is secreted into the plasma by the liver in response to cytokine stimulation. CRP belongs to an evolutionally conserved group of pentamer proteins whose function is the protection of an organism against harmful antigens, including invasive infectious agents from bacteria and viruses, and from pyometra and sepsis. Canine CRP is similar in structure to human CRP, however canine CRP differs in that two of the five subunits that make up CRP in dogs are glycosylated while normally none of the subunits making up human CRP are.  As clone cCRP1 is specifically raised against dog, this antibody has an advantage over other antibodies raised against human that show cross reactivity with dog, as these cross reactive antibodies may not recognize the glycosylated subunits. This product may be used in a direct ELISA or as a detection reagent in a sandwich ELISA, when conjugated to HRP, together with MCA6017GA as the capture reagent.